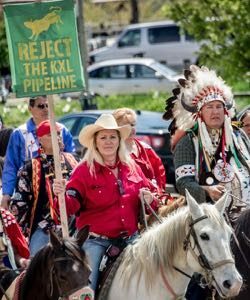 President Donald Trump is intent on constructing a heavy crude oil pipeline, the Keystone XL, that a green coalition has long opposed. WASHINGTON—Despite President Donald Trump’s hype, the long-debated Keystone XL isn’t exactly a pipeline to full employment. Analysts at the U.S. State Department have estimated that the finished product would provide just 35 direct, long-term jobs. But the Republican leader, who campaigned as a “jobs for the working class” candidate, ignored that paltry figure on March 24 when he green-lighted TransCanada’s $8 billion, cross-border, tar sands project that President Barack Obama rejected in November 2015. Trump touted his Keystone XL reversal as just one in a string of infrastructure investments that would put Americans to work. Construction of the 1,200-mile pipeline would provide 3,900 temporary jobs, according to State Department figures. Sean McGarvey, president of the North America’s Building Trades Union, stood smiling at Trump’s side in the Oval Office during the announcement. Meanwhile, union members affiliated with the Labor Network for Sustainability, were frowning. The Maryland-based non-profit calls itself a powerful voice within organized labor advocating for a climate-safe, worker-friendly economy. And Guerrero evidently has the goods to back up his words. Before Obama halted Keystone XL, LNS researchers had issued a 63-page report that spelled out the economic and environmental pluses of having skilled workers fix part of the nation’s infrastructure crisis by rehabilitating, replacing and upgrading existing water and natural gas pipelines along the initially proposed Keystone XL corridor. Trump’s latest move prompted Guerrero to recirculate the report. In “The Keystone Pipeline Debate: An Alternative Job Creation Strategy,” LNS analysts said that the follow-up operations and maintenance of such an investment could create an estimated 7,673 direct, permanent jobs — a number 219 times higher than the 35 spelled out by the State Department. That original corridor through Montana, South Dakota, Nebraska, Kansas, and Oklahoma needs at least $32 billion for top-notch water and gas infrastructure, according to Environmental Protection Agency numbers that LNS used in its arithmetic. Roughly half of that is to fill a gap in capital investments and the other half is for a gap in operations and maintenance. Where would the money come from? Eliminating some of the top subsidies to the fossil fuels industry would be more than enough, LNS analysts say. For starters, they suggest eliminating a provision in the tax code that provides a significant subsidy for the three oil refineries on the Gulf Coast that have been specially outfitted to process Canadian tar sands. In addition, they want to get rid of another three tax code loopholes that allow fossil fuel companies to be subsidized by taxpayers. These include expensing intangible drilling costs, a domestic manufacturing tax deduction for oil and gas, and a percentage depletion for oil and gas wells. While the four authors of the LNS report focused on jobs, conservationists and other Keystone XL opponents have spent years emphasizing other minuses of constructing a new pipeline designed to carry 830,000 barrels daily of carbon-loaded, heavy crude oil processed from dirty tar sands operations in the province of Alberta, Canada. If built, what would be the newest leg of the Keystone XL would extend through Montana and South Dakota to southeastern Nebraska, where it would link to Gulf Coast refineries via existing pipelines. Observers were prepared for Trump’s late March reversal on the lightning rod of a pipeline because of an executive order on oil pipelines he issued in January, just days into his presidency. In his second term, Obama eventually resorted to governing via executive fiat to advance much of his climate and energy agenda because House and Senate Republicans refused to pass legislation to advance his causes. The GOP referred to those orders as dictatorial abuses of power that defied the Constitution. Now, however, GOP legislators are cheering Trump’s orders as signs of action and decisiveness. Even though the State Department has issued TransCanada its construction permits, Keystone XL is far from a done deal. Environmentalists have recently filed at least one lawsuit. 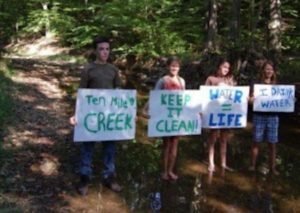 They are bracing to continue a climate- and water-centered fight that has lasted about nine years. Several years ago, Nebraska became ground zero in that clash. TransCanada was forced to reroute the pipeline east of two of the state’s vulnerable natural resources, the Sand Hills region and the Ogallala water aquifer several years ago. Nebraska’s five-member Public Service Commission hasn’t yet granted a construction permit. Another overarching question that Trump is not addressing is why the nation needs to import yet more transportation fuel when the Obama administration set the U.S. car and light truck fleet on track to reach 54.5 miles per gallon by 2025. Of course, the new president answered that in a convoluted fashion when he recently told U.S. auto manufacturers that he’s intent on meeting their request to roll back those standards. That change is not as simple as waving an executive-order wand. But that’s another story for another day. Trump spoke of Keystone XL as if it were one of his offspring when he praised it in the White House last month. Think tank leader Jason Grumet suggested that the Trump administration swap its Keystone XL fixation for dedication to devising an energy policy that focuses on innovative infrastructure and research.